You have such an amazing eye for color. I love those combinations so much! 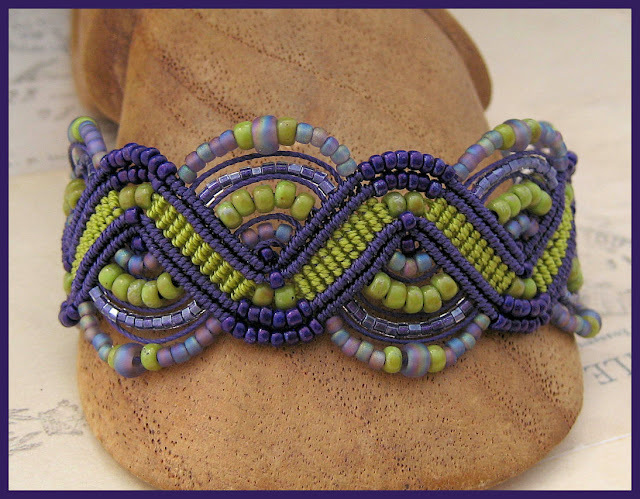 I'm sure I think this about every piece you show... but this colour combo (green and purple) is my VERY FAVORITE!! At least this week LOL. Is it going in your shop or already sold, Sherri? I used to have my own macrame shop in the 70s and 80s. Called the Knotty Lady LOL -- haven't done macrame in a long time but since seeing your beautiful items, you have whet my appetite. Congratulations on beautiful work. I'm so impressed. How cool! I did macrame back then, too. No shop, just lots of plant hangers :) You should totally try this - I'll bet you'd love it! Hi Sherri - gorgeous work! I'm trying my hand at this and wondering - do you have problems with the beaded portions on the outside row of the earrings being "floppy"? Looking for a solution. This isn't an issue with bracelets because they lie flat on the arm but with earrings it is. I haven't really had that problem, but I don't make my earrings very large, either. You might try limiting the size of the overall piece and of the beads in the outer row (or rows)? Thank you for the extremely fast reply! I really appreciate it. I'm not a seasoned macramé-er but really enjoying it so I'll keep working at it and see what happens.